XperiFirm Tool makes the tedious task of manually searching and downloading stock Sony Xperia firmware easy. Xperifirm downloads Sony firmware from official servers and there is no chance of firmware being corrupted. 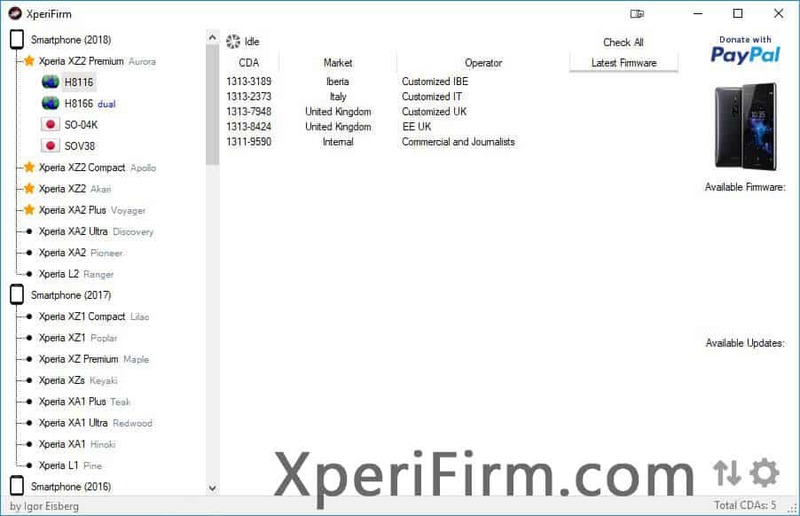 Here on this page, you can download Xperifirm v5.0.0 for Windows 10/7/8/8.1, Linux and Mac. NEW: Download management, including a download queue that's saved on your computer and loaded on launch. NEW: Resuming feature, including checksum verification and automatic re-download of incomplete/corrupted chunks. Just click "Start" and the download will attempt to resume (for large firmware, the resuming might take a while). MINOR: Better error handling and prevention. MINOR: Settings: "Play a sound when a download completes"
NOTE: "Manual" button and "Unpack automatically" are both obsolete, thus were removed in this version. Firmware will always be unpacked. Below you can download Xperifirm v5.0.0 for Windows, Linux and Mac. To use it on Linux and Mac, install Mono on your system (instructions provided below). [*] Always Scan First: We have scanned XperiFirm_5.0.0_(by_Igor_Eisberg).zip before sharing it here. However, we still recommend you to scan the file before using.